The fundamental building blocks of matter are today thought to be quarks; the accoring theory, describing their dynamics, is quantum chromodynamics, QCD. Single quarks are not observable in experiment; they carry so called colour-charge (thus „chromo“). Observables are colour-neutral, thus consist of three different-coloured quarks (baryons) or a coloured quark and its anti-quark (mesons). For instance, the proton and the neutron are baryons, and thus understood as bound states of three quarks. They may be described within relativistic constituent quark models (CQMs). One obtains their quantum-mechanical spectra containing information on the particle characteristics such as energies (masses), flavor contents, total angular momenta, and spatial parities. In order to make these qualities perceptible by sound we have developed a Quantum Browser. It allows to discriminate between the excitation spectra as generated by different CQMs (relying on different dynamical ingredients). The pitch is mapping the energy value of the particle. By listening to sound sequences one can then compare, e.g., the level orderings characteristic of the assumed quark-quark interaction. The spectra of energy levels consist of about ten tones. Thus they are highly complex, and it was found that they are better studied in changes in the melody of successive energy levels. Interactively, particles may be turned on and of. The first example gives the sound for the setting as shown in the figure above as three melodies of rising energy levels. 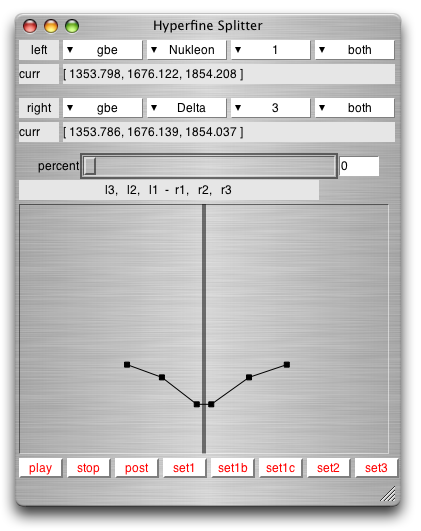 The second example gives the same as continuous sound chords. One interesting feature of baryon spectra is the splitting of energy levels depending on one parameter in the model, the hyperfine interaction: thus in a second attempt we designed a Level Splitter. The hyperfine interaction is needed in order to describe the binding of three quarks more realistically, i.e. in accordance with experiment. If it is absent, certain quantum states are degenerate (meaning that the corresponding energy levels coincide). In a demonstration example, we chose the excitation levels of two different particles (the Neutron n-1/2+ and the Delta d3/2+), calculated within the same CQM, the Goldstone-Boson Exchange model. These two particles are degenerate when there is no hyperfine interaction present. Mapped into sound this means that one hears a chord of three tones for the ground states and the first two excitation levels, which are the same for both particles. Here, auditory perception is more challenged than in the Quantum Browser, as complex spectra are being played as continuous chords, and the hyperfine interaction may be turned up gradually (to 100 percent). Thereby, the energy levels are split, and one hears a complex chord of six tones. The particles can be distinguished now, as they are in nature. With the Level Splitter, the dynamical ingredients leading to these energy splittings may be studied in detail, and likewise the quantitative differences in distinct CQMs. Here you can find the audio example described above. The spectrum changes from the settings of the left figure as shown above continually to the right one and back. For a detailed description please refer to the Downloads Section. 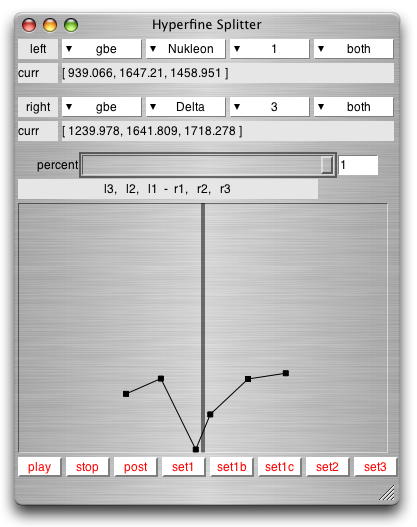 There you may find the paper "Sonification as an interdisciplinary working process".